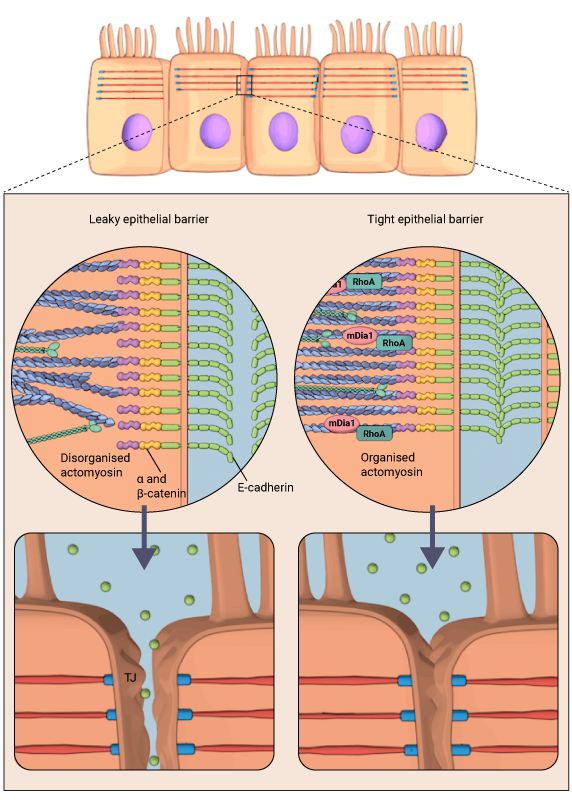 This study addresses the role of formins at epithelial junctions. A major formin, mDia1, is shown to be recruited to Adherens Junctions (AJs) by E-Cadherin and RhoA. This leads to the organization of actomyosin filaments around the AJs which causes an increase in junctional contractility. Consequently, Tight Junctions (TJs) as well as the epithelial barrier are stabilized. 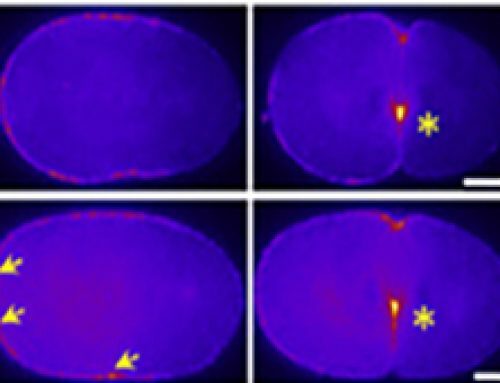 These findings were published in Cell Reports in 2017. Acharya BR, Wu SK, Lieu ZZ, Parton RG, Grill SW, Bershadsky AD, Gomez GA, Yap AS. Cell Rep. 2017 Mar 21;18(12):2854-2867. doi: 10.1016/j.celrep.2017.02.078. Mammalian Diaphanous 1 Mediates a Pathway for E-cadherin to Stabilize Epithelial Barriers through Junctional Contractility. Figure: mDia1 is required to organize F-actin through RhoA and E-cadherin for effective junctional contractility and subsequent maintenance of epithelial barrier through Tight Junctions (TJs) (Right panel). The left panel shows a leaky epithelial barrier and underlying disorganized actomyosin cytoskeleton on the absence of mDia1 at the AJs. In this study, a previously unknown role of formins at the Adherens Junctions (AJs) was explored. 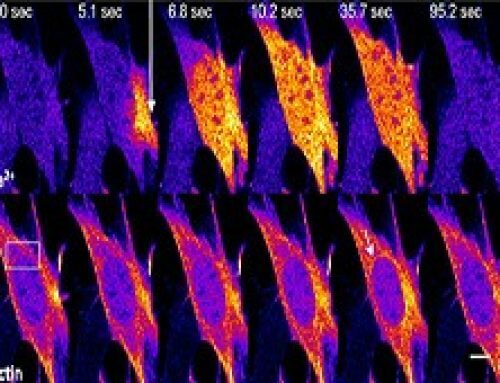 A FRET –based tension sensor (TS) technology was developed to measure tension at the AJs by probing for tension across αE-Catenin, which links E-cadherin to the actomyosin cytoskeleton. This study reveals that formins play an important role in creating junctional tension at the AJs. The formin mDia1, is recruited to the AJs through E-cadherin and RhoA. 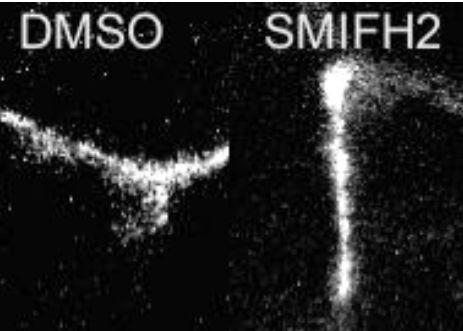 Once at the AJs, mDia1 facilitates the architectural reorganization of actomyosin filaments into organized parallel bundles. 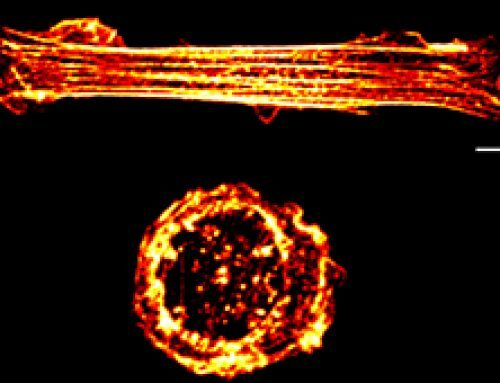 This generates actomyosin contractility and junctional tension. The junctional tension extends well beyond the AJs and stabilizes the Tight Junctions (TJs). This in turn maintains the epithelial barrier and prevents the flux of solutes and macromolecules in and out of the cells. What are Adherens Junctions (AJs)? What are Tight Junctions (TJs)? Formins promote the elongation of pre-existing filaments by removing barbed end [capping proteins and forming a sleeve around the actin subunits. Formins are also capable of actin nucleation, a process which is spatiotemporally coupled with actin disassembly. The adherens junction is a type of stable cell contact, or anchoring junction, which keeps cells in a tissue together by forming an interconnected lateral bridge that links the actin cytoskeleton of neighboring cells. 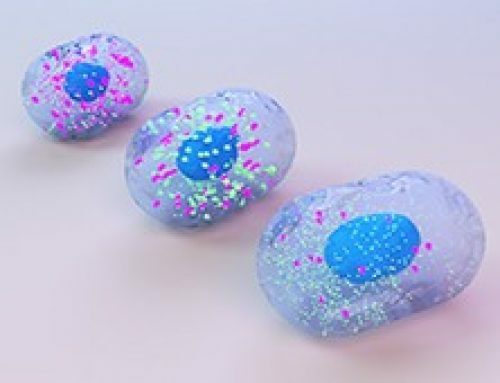 They are constantly assembled and disassembled, allowing cells within a tissue to respond to forces, biochemical signals, and structural changes in their microenvironment. The events leading up to adherens junction formation are still not entirely clear, but they ultimately result in the recruitment of transmembrane cadherins, catenins (beta-catenins, alpha-catenins)and cytoskeletal adaptor proteins that form the primary architecture of adherens junctions.In cardiac cells, contractile bundles are anchored by adherens junctions while in nonepithelial tissues, adherens junctions link cortical actin filaments between cells. Adherens junctions regulate cell shape, maintain tissue integrity and translate actomyosin-generated forces throughout a tissue. A key component of adherens junctions are the transmembrane glycoproteins cadherins, which bind the intracellular proteins p120-catenin and β-catenin, after which α-catenin is recruited by β-catenin. 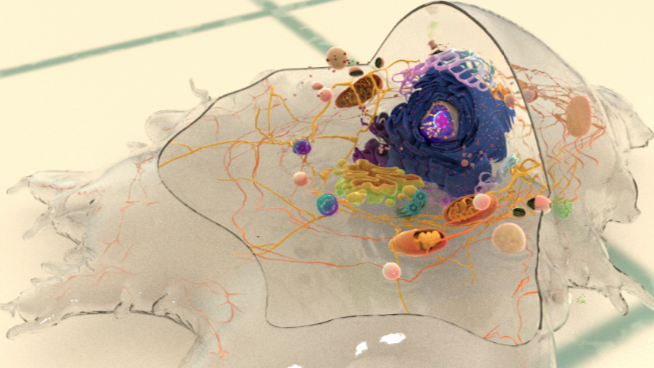 A vast network of adhesion receptors, scaffolding proteins, actin regulators and signaling proteins regulate the formation of this complex, via a complex network of interactions, which is currently being characterized and has been named the cadhesome .While in cardiac cells, contractile bundles are anchored by adherens junctions, in nonepithelial tissues, adherens junctions link cortical actin filaments between cells. mDia1 is recruited to junctional cortex in response to E-Cad adhesions and RhoA and plays a major role in generating junctional contractility. mDia1 facilitates architectural reorganization towards generating actomyosin bundles in the AJs. 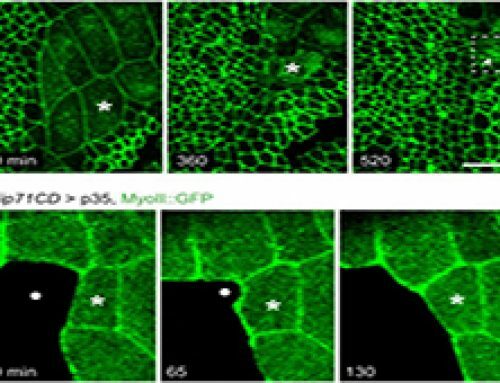 mDia1 stabilized proteins of both the AJs and TJs to regulate epithelial permeability and maintain the epithelial barrier. A FRET-based tension sensor (TS) was developed that reports molecular-tension across αE-catenin. Fluorescence Resonance Energy Transfer (FRET) is a technology that relies on the distance-dependent transfer of energy between two fluorophores, a donor and an acceptor. The donor absorbs the energy and when in close proximity to the acceptor, transfers the energy to the acceptor. The emission intensity from the acceptor can be measured. In this study, a TS module was inserted between the N-terminal β-catenin binding domain and the F-actin binding domain of αE-catenin. If the protein is subject to tension from both ends, the protein will be stretched separating the FRET donor/acceptor pairs, resulting in a low FRET index. The FRET-based TS technology may be adapted to analyze functions of other proteins involved in force transduction.